Most gardeners are waiting for the first week in June before they plant out their Summer flowering annuals. 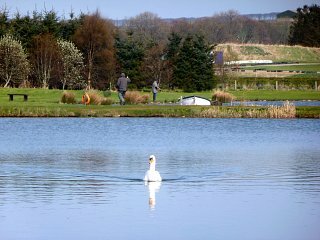 For anglers at Lochter Fishery in Oldmeldrum, Summer is already here and away go many of the sinking lines and big lures and on go the floating lines dries, nymphs and buzzers. Tom Weir put on a cast of buzzers and crunchers and ended with ten nice fish. A mix of buzzers and dries was the choice of Andrew Barrowman and twenty trout were tempted. Alan Noble used black and green buzzers to land ten and team McPherson, Michael & Andrew netted thirty nine between them. Kevin Reid from Newmachar had a great day with eleven on klinkhammer dries and snatchers. Bill Gerrie grassed eight using the new muskin crunchers and many anglers had bags of six plus using small natural flies. At the time of writing the sun has been obscured by that plague of the North East, coastal haar. The outlook however is for things to turn bright and breezy.